Let me start by saying that of all the posts I’ve ever done here at TME, this might be my fav. There’s a deep sarcastic streak in me that maybe only my brothers and husband and parents recognize, but it’s strong and needs to be fed with slightly harsh, humorous fun. Maybe you have one of those special people in your life, too. Well, you’re welcome. Here are some perfect gifts for them. 1. Are You There God, It’s Me, Margarita – I don’t care what this book is even about, I want it. It is about literary-driven cocktails, so I want it even more. The perfect host, teacher or book club gift. 4. I’m A Special Unicorn Tea Towel – For that only-child in your life. It’s not lost on me that Sienna wants all unicorn things for Christmas. 5. Classy Jewelry Holder – We all have someone who loves using this gesture to express themselves. Now you can give them the finger! 6. Tidings of Comfort & Joy…and Cookies & Bourbon Card – I mean, who would I not want to give this to. 7. Surely Not Everybody Was Kung Fu Fighting Cross Stitch – I mean, surely not everyone. For the realist. 8. Not Today, Satan Bracelet – For the devilish-kind on your list, a gentle reminder. 9. F-Bomb Paperweight – For my former boss, who really liked that word. 10. I’ll Stop Wearing Black When They Make a Darker Color Mug – Goth gift alert! 11. Cantankerous Cats Card Game – I’m not a cat person, but apparently some people are. You can get this for them. 13. Nope Desk Sign – Just, no. 16. So Emotional tee – “every time I think of youuuuu…” It has a whole new meaning now. Meaning, you know who needs this in your life. 17. Duchess of Sassy Town socks – I know some 5-year-olds…and some 40-year-olds who def need these. 18. I’m Not Perky Sweatshirt – Wednesday Addams is my hero. I hope I’ve provided some passable ideas for the dry-humored folks on your list. If you’ve found anything acceptable for those of us who prefer a fine wit to typical holiday gifts, do share. Tidings of peace…and quiet…to you! P.S. Head over to our full page of 2018 holiday gift guides for more seriously cool gift ideas for all your loved ones (or whoever). Be sure to follow me on Instagram @elletrain to see daily outfits, and sometimes I’m quippy in my post comments, on good days. Don’t forget about LikeToKnow.It for easy-peasy shopping of the looks I’m loving. And thank you to my forever-sarcastic-loving friend, Posy, for a few of these lovely contributions. I stumbled on these last year and asked my husband for any and all as a gift, but they were sadly sold out or wouldn’t ship in time for Christmas. But I still covet them, and would giggle with glee every time I used them. Something about the ornate, frilly style and the biting insults just kills me. Thank you for this post! Checked off a couple gifts on my list! 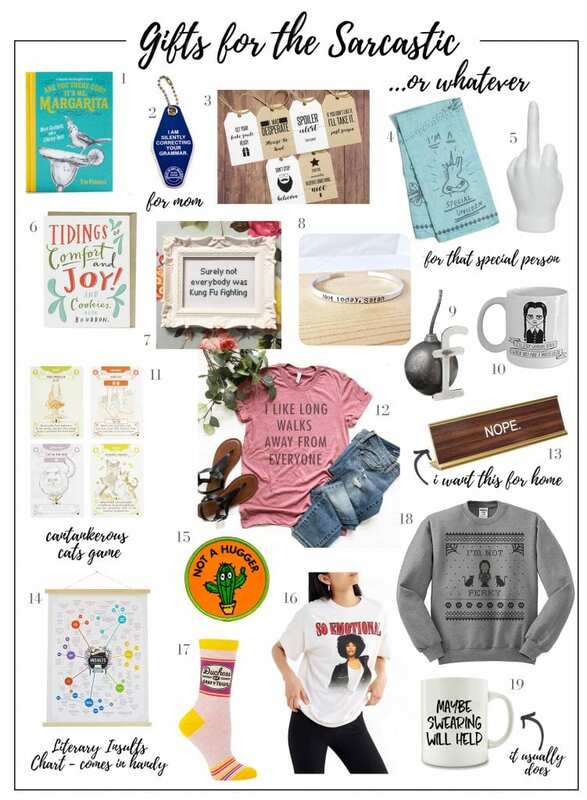 This may be the best gift guide I’ve ever seen! Love everything and am going to get at least 1/2 of my shopping done with these ideas! Thanks so much!!! Haha yay! I’m so glad! !